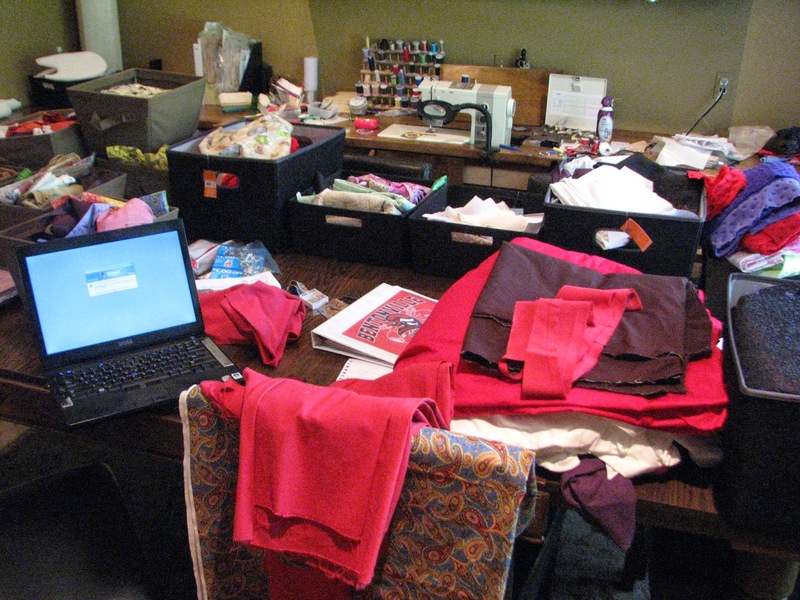 In preparation for my daughter's Prom dinner in late April, which was soon followed by a graduation party in mid-May, my sewing room was stripped of sewing materials, boxed up and stored in my husband's home office. Okay, so the sewing room is also our dining room. I completely understand why someone would want to get rid of this mess. Husband then told me his great idea for creating a sewing room all my own, made possible by a series of moves: (1) building a new home office on the first floor, (2) moving my daughter's room to the old office, (3) moving my son to my daughter's old room and (4) creating a wonderful sewing spot for me in my son's old room. "So, you may as well leave everything boxed up until we're ready to move." Which would be late August, at the earliest. As slow as we move, it would probably be next August. Although slightly intrigued by the idea of designing a perfect sewing room from scratch, I really just wanted to SEW NOW, but with my supplies and tools stored upstairs, I'm restricted to what really NEEDS to be sewn. Luckily, my daughter's summer job required a button-down shirt. Her manager suggested she buy it in the young men's department at Penney's. What!? We even had trouble finding a well fitting button-down shirt in the ladies' section: either too baggy in the shoulders or too tight in the chest. Mom to the rescue! I picked through the boxes stored on the second floor to find my scissors, seam ripper, measuring tape and pins. Just the essentials. We found McCalls 6124, which is not a button-down shirt, but that's an easy fix. It doesn't have a yoke, or a shaped bottom hem, but it does have princess seams. I have never been comfortable wearing a fitted dress shirt. They always feel tight across my back and chest, and usually baggy around my waist. I ordered some stretch shirting to alleviate the tight factor. We were given a few approved colors, all of which were pastels, none of which are the most flattering on Stephanie, who looks better in bolder colors. Rules are rules, though. Since this was to be my first button-up/button-down, I ordered some relatively cheap fabric from Denver Fabrics, which was rather disappointing. First of all, it has a very stiff drape, a "spongy" feel, and wrinkles easily. Most importantly, and most annoying of all, there were many different shades of baby blue to be found on the one contiguous piece of fabric I received. Even though I cut it using the "with nap" layout, the two back pieces are clearly different colors. Left center back is a few shades darker than right center back. I wasn't completely pleased with the outcome of the shirt, but I'm not sure if it's due to the pattern, my FBA or the poor quality shirting fabric. I am willing to give the pattern another go, next time with some nicer quality shirting from Mood. [That fabric is took too long to ship, and her summer job is winding down, so I won't be making another one for her]. I wouldn't mind trying one of the longer styles for myself -- they have a nice flare, and I imagine they would look cute with leggings. If I wore leggings. Never mind. Isn't it cute? I may learn to like leggings, after all. What would I change next time? Princess seams: there is built-in ease on the front piece, that I was not able to steam out. It's not enough ease that it looks shirred, only enough to make it look like you don't know how to sew. Next time, I'd either increase it or remove some. The barrel sleeve feature is not per the pattern -- I accidentally cut one sleeve too short (don't ask) -- so this is my fix. I actually like it though. I thought there was too much ease in the sleeve cap, at least for this fabric. If I make it again, I will reduce the ease, or make sure I can steam it out. It just didn't look right to me. Other changes I made, were to shape the bottom hem, flat-felled the seams and edgestitched/topstitched the collar, band and plackets. Used a RTW shirt as a guide for the shape of the hem. The pattern is a straight bottom hem. Even with the problems, it looks really cute on Stephanie, and fits her better than the RTW shirts that we found. Her co-workers like it as well. The ladies wanted to know where she found such a nice fitting shirt! This project intrigued my husband, in terms of the stretch shirting. "Can you make a dress shirt for me?" He also ordered some from Mood. Perhaps I will soon have an important enough project to get the rest of my supplies moved back to the dining room!